Since 1991, we have successfully developed more than 100 major initiatives. We have found the following services most valuable to clients in launching and sustaining effective social enterprises. Our expertise covers a wide range of related topics, such as resilience, positive youth development, military families, mentoring, communication, leadership, stress management, and wellness. Our portfolio includes over 500 hours of in-person, online, and blended training curriculum and proven practices that have brought solid results for local, national, and international programs. To learn more about DMT’s work in these areas, please explore our portfolio and visit our client engagements page. We work exclusively in the social services arena and, like our partners, are passionate about creating positive outcomes for vulnerable populations. We specialize in providing cutting edge, performance management solutions through a systematic approach that produces important social outcomes with greater certainty and in less time. We differentiate ourselves from other social services consulting firms with our proprietary Program Development Model, which encompasses all our knowledge, skills, and competencies. Our model guarantees that we use proven and repeatable processes to help maximize your investment and develop sustainable, measurable results. This blueprint applies the principles of accountability, organizational teamwork, and performance management across virtually all projects. 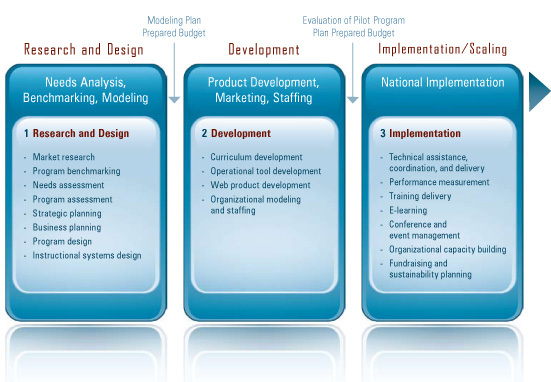 The model is a common framework on which we integrate the knowledge and expertise necessary to address each specific project and accommodate every partner’s unique situation.